So I just finished an excellent book called The End of Your Life Book Club by Will Schwalbe. I really like to read books about people writing about books they love. I learn about new books, and I often gain new perspectives on books that I have also read. This book was more than that though. It was also about the relationship the author had with his mother, and it’s also a tribute to his mother. They began this book club after she was diagnosed with Stage 4 pancreatic cancer, but throughout the book I also learned about her life. She’s very inspiring. She worked in refugee camps in several places around the world. A very important cause to her was also establishing a library in Afghanistan (she successfully did this). So anyway, I really enjoyed it, and I was curious to learn more about the author. He’d been a book editor and in the book he describes how he left that work to start a website called cookstr.com. It’s a fun site with lots of great recipes. So all that to explain how I discovered that the national dessert of Australia and New Zealand is the Pavlova. I’d never heard of this dessert before. I read about it, learned that it was very low fat, and so decided to try it out. cookstr had a recipe for individual pavlovas. It’s kinda like strawberry shortcake, but the base is not cake, instead it is a baked meringue. You shape the meringue into disks and then bake it. My disks do not look nearly as tall and nice as the ones pictured on the website. This may be a combination of my altitude challenge here in Colorado, and perhaps I am also somewhat meringue challenged, as I’ve not made it many times. However, I think I succeeded in capturing what the bases were supposed to taste like. The base is just eggwhites, sugar, vanilla, cornstarch and a pinch of salt. Once you bake the meringues, you just layer whipped cream and berries on top. Very easy. David took one bite of the meringue base and his first comment was “Strange”. Not exactly what you want to hear. But it is unlike anything I’ve ever made. It is kinda chewy and sort of reminds me of a more solid cotton candy. It is very sweet and I wouldn’t want to eat it by itself, but I thought it was really good combined with the whipped cream and berries. I didn’t actually use whipped cream this time. I used Cool Whip. 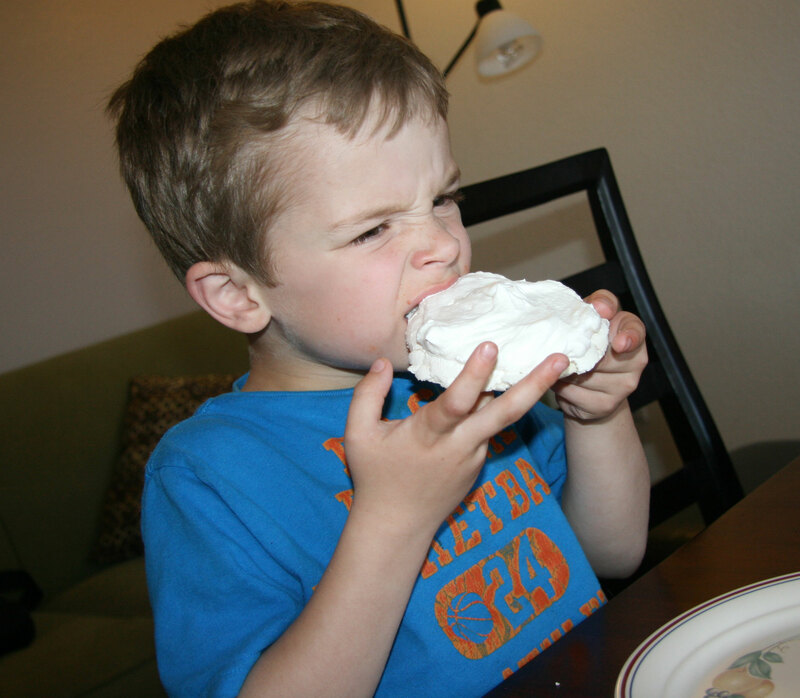 David loves cool whip and we were trying to keep the dessert low fat and low calorie. Next time though I’d love to try it with real whipped cream. Despite David’s initial “Strange” reaction, I think the dessert grew on him. He was ready to have another one today. Davey wanted to try one too (without the fruit). He looks a little unsure here. He wasn’t too thrilled. I wish he’d tried it with the fruit as well! So in summary this was a great book that led me to a good website where I found and tried what I think is a pretty fun dessert! 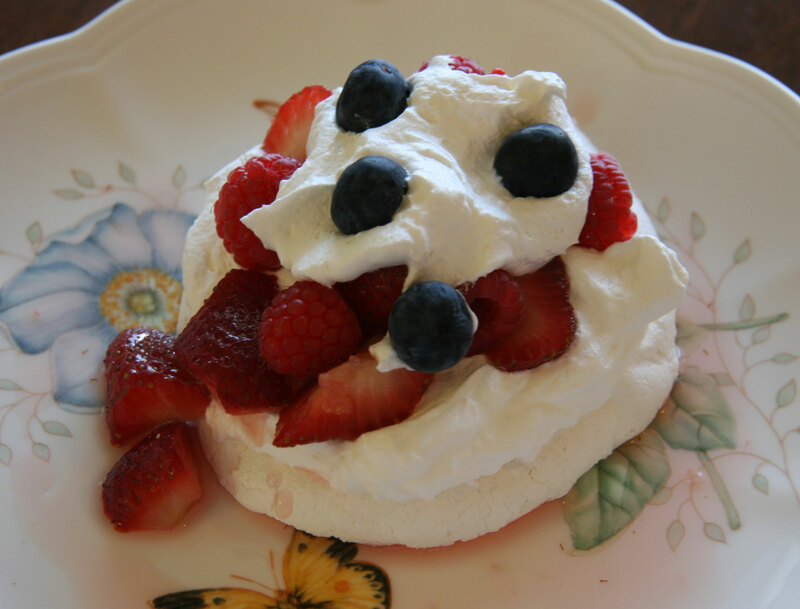 This entry was posted in Cooking and tagged cookstr.com, Pavlovas, The End of Your Life Book Club by cpeezers. Bookmark the permalink.